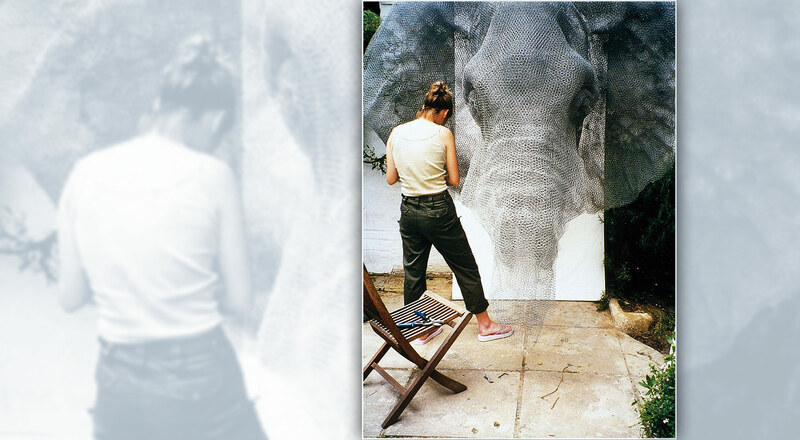 Lions, tigers, polar bears… all kinds of wild animals serve as inspiration for the galvanized wire mesh sculptures created by British artist Kendra Haste. With unparalleled expressiveness and attention to detail, the sculptor manages to give life and form to the musculature of each of the wild animals using a material that is seemingly so cold. Haste, born in 1971 and an MA graduate from the Royal College of Art in London, is a member of the UK Society of Wildlife Artists and the US Society of Animal Artists as a result of which her work is centred around the animal world. ‘Animals have held an obsessive fascination for me throughout my life. Their diverse form, nature and behaviour provide a rich and inexhaustible depth of subject. Animals have been for many years and continue to be the sole focus of my work as a sculptor’, says Haste. Haste’s works are 100% hand-sculpted without the aid of moulds or mechanical processes, which makes for a slow and laborious creative process. The sculptures have a steel armature to ensure stability, which the artist then covers with a basic skeleton over which she applies the layers of wire mesh to construct the musculature, skin and surface details. For Haste, ‘although some of the internal layering cannot be seen I feel that, if it was not there, the form would lack integrity and as the mesh has holes it suggests the underlying muscle and bone, adding to its sense of vitality and movement’. Many of the artist’s pieces have been on display in the Tower of London since 2010, commissioned by Historic Royal Palaces as a celebration of the Royal Menagerie at the Tower of London. Records dating back to 1210 show that the Tower of London housed a wide variety of exotic animals in the past, acting as a kind of medieval zoo. Haste currently has thirteen examples of her work on exhibition there, including lions, an elephant and a polar bear, in homage to the site’s ancient inhabitants.